Over the past two decades, laboratory, fieldwork, and modelling studies have conclusively shown that interactions between gas-phase species and atmospheric aerosol particles (termed heterogeneous atmospheric chemistry) can significantly influence the chemistry of the atmosphere. Although a significant amount of research has focused on heterogeneous atmospheric chemistry during the last two decades, this field is still in its infancy, especially in comparison with gas-phase atmospheric chemistry. One of the goals of our research is to identify key heterogeneous reactions that are important in the atmosphere, and determine the parameters needed for modelling these processes. 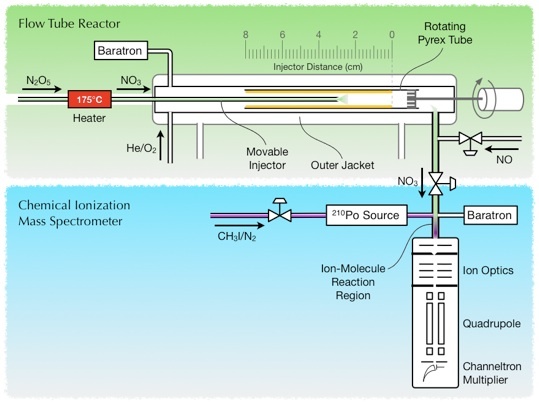 Atmospheric heterogeneous reactions are simulated and probed in the laboratory using aerosol reaction chambers, flow tube reactors, and state-of-the-art analytical techniques such as polarization modulation infrared reflection absorption spectroscopy. From the laboratory data we determine the fundamental kinetics and mechanisms of these reactions and develop theoretical frameworks and mathematical models for incorporation into atmospheric models. Although organic particles are abundant in the troposphere, relatively little is known about their heterogeneous chemistry. Using flow tube reactors, an ultra-sensitive chemical ionization mass spectrometry, and FTIR spectrometry we have been studying several reactions between atmospheric oxidants and organic aerosol particles. Specific reactions include NO3 radicals with organics, N2O5 with organics, and O3 with meat-cooking aerosols.